In such a short history, fraternities have evolved immensely and have experienced a vast shift in cultural identity. Many would suggest the only constant among all this change has been the values we say we represent, but are we sure about that? Over the past few months, I have questioned what fraternities actually represent; not by what we say, but what we do. This question demanded that I take a closer and more detailed look, so I decided to follow “fraternity” via Google’s alert system for the past month and see what was being reported on the Greek life I love so much. To say the least, I was beyond disappointed. Turns out, there has been a lot of negative coverage on fraternities lately. It seems as though the media is relentless in their pursuit to find any and all negative byproducts of this system. I can hardly blame them; no more than I can blame the media for those actions being made in the first place. Too often, we jump to the same tired defense, arguing that the media fails to report all the good we do. But is the good we do good enough? Have we reached a point where we truly believe that six community service hours justifies the mental distress of an 18 year old? Do we think raising 6,000 dollars can replace a life? Like it or not, these horrible acts are committed. And yes, they will always be the only aspect of fraternity reported by the media. But is pointing out the good we do even an appropriate response? It’s like we just accept this behavior as a necessary evil to all the good we do. I just can’t bring myself to believe that. Instead of fighting against what is reported, let’s give the media nothing to report. We say we hold ourselves to a “higher standard” yet too often there is a report of alleged hazing or sexual assault by a fraternity member. Look, we will never be able to control what is reported, but the one thing we can control is our actions. Let’s stop playing into the stereotypes that we created. I guess what I’m asking is at what point will we truly do what we say we do, without exception. Reaching that point includes everyone in the community. Regardless what you think your level of guilt is in all of this, if you’re not doing something to actively stop those who are, you’re not doing anything to help our cause either. Remember, the next time you turn your eye to what you think is minor hazing, it was that same bystander behavior that led to the death of an 18 year old being the top story on CNN.com. Are we so far off the beaten path that we can’t come back to the pure state that we once were? Are we so concerned with fulfilling social norms that we dismiss the very reason we exist as an organization? Is the type of man that our fraternities originally sought even relevant anymore? If you are looking for an answer, I don’t have them. Sorry. What I do know is that I took a vow to my organization, promising to be a better man and to make a difference. I’m committed to this vow. I commit to never giving up on our high ideals. I truly believe in Fraternity. I’d like to challenge the fraternity men who continue to dismiss the values by which they vowed to live: I challenge you to start living to our high standards and stop making those men doing the right thing defend your actions with their own. I challenge you to stop giving the media stories to report. I challenge you to earn your place in this Greek life I love so much. Our military academies are not filled with moral paragons. Like their peers, their student bodies are populated with young Americans in their late teens. They are every bit as human, and an honor code has never been a guarantee against scandal. From the huge 1951 cheating scandal at West Point that saw more than 80 cadets expelled (including nearly half the football team) to more recent scandals at Navy and Air Force, the academies have had their share. The difference is they don’t delegate to the NCAA the idea of right and wrong, and they take community seriously. On these campuses, no man is an island. The message is: You are all in it together. The parallel for fraternities is clear: any chapter is capable of making a mistake and getting in trouble. The difference between mediocre chapters and excellent chapters is how they respond. Failing chapters circle the wagons, shift blame and look the other way when peers abandon their values. Excellent chapters acknowledge the misstep and hold their own members accountable rather than waiting for some higher authority to take action. The ingredients of Miami’s vices—the nightclubs, the prostitutes, the yachts—make it far juicier than the typical pay-for-play. The scandal here is not that teenage football players behave badly when a wealthy benefactor indulges their every appetite. The scandal is what it says about the impoverished sense of community on our college and university campuses, and the fecklessness of those who know better. The cover story for upcoming fall issue of The Delta takes an in-depth look at traditional honor systems, including one of the institutions mentioned in this article. As we’ll see, peer accountability combined with a culture of trust is the essence of the honor system. As the only fraternity founded on the honor principle, Sigma Nu chapters must show their communities that self-governance works. We all have strong convictions about something. It could be a political belief (“taxes hurt small businesses”), or a historical narrative (“FDR ended the Great Depression”) or even the eminence of a favorite sports team (“Chicago Cubs are the best baseball team ever”). Maybe it’s something as simple as a favorite TV show (“Hands down, Entourage is the best show to ever grace the airwaves”). Whatever it may be, everyone is passionate about something. For a fan of the Detroit Lions a win brings him a sense of joy, but he can acknowledge, after observing the team’s record over the past ten years, that the franchise is not the best in the League. For a fanatic, on the other hand, evidence doesn’t matter. The Detroit Lions are the best team in the League, period, and no amount of reason or logic will change his mind. It sounds silly in a sports analogy, but from time to time we’re all prone to such blindness in our decision making in other areas of our lives. So what happens when we’re confronted with new evidence that conflicts with an existing worldview? How will you react? Will you take a big gulp, swallow your pride and change your mind? Or will you frantically search for stories that confirm your narrative and ignore anything that refutes it? Thankfully for us Sigma Nus, the anecdote to fanaticism is right in front of us. Our founding principle of Truth expects us to make decisions based on sound information, even if it might not support our existing belief. In short, Truth calls on us to keep an open mind–to consider the possibility that we made a mistake in our thinking. It requires us to walk away from a false paradigm no matter how psychologically painful it might be. Which brings us to the #40 Answers in 40 Days Campaign. Beginning tomorrow, and continuing through National Hazing Prevention Week, hazers will be confronted with a steady assault of evidence and logic that questions a deeply rooted worldview—a worldview that regards the arbitrary mistreatment of new members as a legitimate way to build lifelong friendships and commitment to the fraternity. For hazing’s True Believers we ask one thing: Consider the possibility that you might be wrong. IBM celebrated its 100th birthday last month and the iconic company’s history offers several parallels for fraternities. In those days, Big Blue was the place everyone wanted to work and invest. It recruited the best graduates from the best universities, imbued them with its core values of “excellence,” “customer service” and “respect for the individual,” and sent them out in blue suits and white shirts to sell the world on electronic computing. Here’s a company whose researchers won Nobel prizes, whose executives stood up to discrimination and prejudice before it was fashionable, and whose name could invariably be found on the list of major donors of the best universities and cultural institutions. And its computers outfoxed the world’s chess champion and took the crown in Jeopardy. It wasn’t, however, just the strategy that had gone awry. As Steve Hamm writes in a book commissioned for the 100th anniversary, “Making the World Work Better,” some of the core beliefs that had carried the company through other periods of transition had become impediments. Respect for employees, according to Hamm, “had morphed into a sense of entitlement, “excellence in all things had turned into a decision-inhibiting perfectionism, and “the best customer service” became an exercise in giving customers what they said they wanted rather than presenting them with the breakthrough innovation they never knew they needed. By 1993, things were so desperate that IBM for the first time reached outside its ranks and hired Lou Gerstner, an executive with RJR Nabisco, as chief executive. Gerstner mounted a painful rescue that included closing facilities, selling off businesses and firing 35,000 employees. Gerstner’s strategy was to move IBM out of low-margin equipment manufacturing while moving more aggressively into software and corporate outsourcing of computer services. Under the current chief executive, Sam Palmisano, who took over in 2002, that strategy includes a strong focus on cloud computing, strategic consulting and data analytics. It is the 4th of July, so in accord with the tradition to which we all subscribe as Americans, I am re-reading the Declaration of Independence. Why are you laughing? We all do it, right? OK, admittedly reading the Declaration on the 4th is a bit odd. I am a traditionalist at a time when a lot of tradition seems to be tweeted to the winds. I attribute my odd practice to the fact, when I was in high school, I was required to memorize the preamble to the Declaration of Independence. I became addicted to great words conveying great ideas. Who would not recognize the timeless words, “When in the Course of human events..,” and “We hold these truths to be self-evident…” Ol’ Tom Jefferson sure knew how to coin a phrase for the ages. He knew his words would be etched into history. He understood his audience would include future generations he would never know. Thus he took great care. Reading these closing words this time, I was given to substitute “Fraternity” for “Declaration” in the first phrase. The preface to this writing was thusly “borrowed” shall we say—borrowed, but not without basis. For much like our beloved country, our fraternity firmly relies on the “protection of divine Providence.” The earthly Knights—or Swiss Guards—of our protectorate are our staff in Lexington and elsewhere, led by Brad Beacham and Brad Hastings. They are young, honorable, talented men who have dedicated their lives and worldly pursuits to a set of common ideals over personal fortune. They personify the Life of Love and should inspire our gratitude and respect. “Our lives”—we pledged to believe in the Life of Love for until death. “Our fortunes”—we pledged to lend a “Helping Hand” and do all we can to ensure the perpetuation of our fraternal ideals throughout the world, forever. “Our sacred honor”—quite simply, ours is the Honor Fraternity. It is our raison d’etre. You get the picture. As an analogy, it is nearly perfect. Some 94 years after the Declaration of Independence, our founding ideals were set to align with it, and 142 years hence from that date, Sigma Nu soldiers on under the same indelible banner. You can’t tweet that away. With this in mind, I read the results of a poll which were published recently in the Wall Street Journal. The question posed was: “Are you happy?” Nearly 60 percent of respondents said they were “Pretty Happy,” and another 30 percent said they were “Very Happy.” In a time of political tumult and a dreadful economy, it is interesting to witness that our level of happiness is not dictated much by politics or the economy. That’s quite telling. Perhaps, despite all angst of the moment, we take long measure of our blessings when presented with such a question. If one is blessed by a loving spouse, wonderful children, good health—and has not missed a meal lately—how can he not be happy in the overall scheme of things? Or maybe happiness has to do with loyal friends, fulfilling work, financial security, the beauty of nature, the wonders of human achievement, the blessings of liberty, the rewards of an honorable life well-lived, and/or a loving and forgiving God? Quite simply, we live in the greatest place in the world and the greatest time in history. We have a lot to be thankful for, and we know it. On that basis alone, how could any witting man not experience happiness, at least in a relative sense? Relative happiness, sure, but what’s more? I would answer that “What’s more?” is the complete joy that comes from giving—giving behind the ideals in which you believe—giving in support of the institutions of goodness in the world—giving to perpetuate the type of relationships which helped mold you into a man and shape you for the better—in short, giving to ensure that the world you will leave behind one day will be better than the one you inherited. 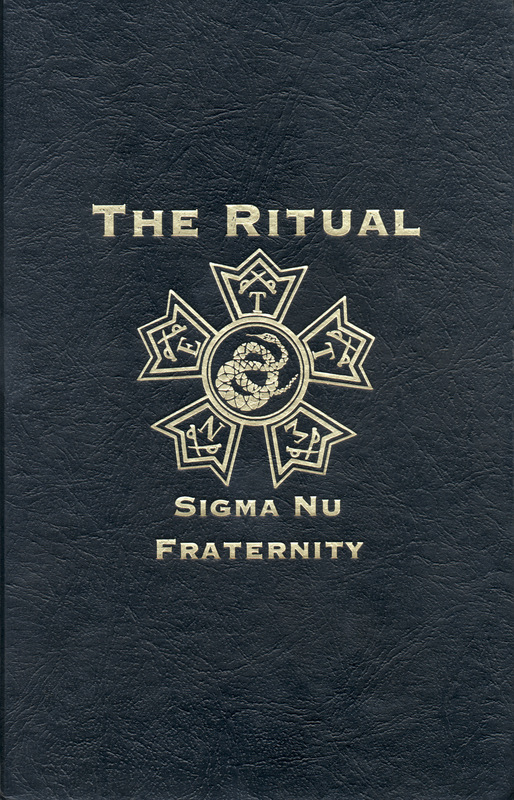 My guess is that when a member of our Brotherhood reflects on the influences in his life that shaped his sacred honor, fostered his life success, and rendered him, at the end of the day, happy, he will find Sigma Nu prominent among them. Quite simply, we are blessed to be part of the greatest fraternity in the world. Sigma Nu deserves another 140 years and beyond, but she needs our financial support. There is a line in the movie “True Grit” to the effect that there is nothing free in the world except the grace of God. I believe that also free is the will of man. We are free to put our lives, our fortunes and our sacred honor behind that which we believe…the Life of Love, the Way of Honor, and the Light of Truth. Thus, I pray that, for the sheer joy you will experience today—and for the benefit of generations of tomorrow you will never know—you take time this Independence Day to pledge an appropriate measure of your fortune in support of the great ideals and work of our beloved Fraternity. It will be etched in history if you do. Br. Densborn is a past Regent and longtime volunteer for the Fraternity. Every two years Sigma Nus from across the country convene at Grand Chapter–the supreme governing body of the Fraternity–where collegiate and alumni delegates vote on changes to The Law and elect new national leadership, among other matters. As every Sigma Nu should know, the votes at Grand Chapter are overwhelmingly controlled by the collegians. This means that no bylaw is passed and no leader is elected without the collective approval of the undergraduate members. It was established from the beginning that the General Fraternity would regard undergraduate chapters as self-governing entities; this is the essence of the Honor system. Even the best chapters make mistakes on occasion. With sound chapter operations, these groups are prepared to handle their own problems, whether it be through a local honor court or a more formal Trial Court. Excellent chapters are willing to discipline their own members. The High Council (Sigma Nu’s elected board of directors) and the General Fraternity are obligated to take action only when a chapter is so operationally dysfunctional that it’s incapable of holding its own members accountable. Boise State has self-imposed sanctions on its football program as it faces NCAA allegations charging the school’s athletic program with a lack of institutional control. “We pride ourselves on doing things the right way at Boise State. As soon as we became aware that these inadvertent infractions were not in accordance with NCAA rules, we acted swiftly and without hesitation,” football coach Chris Petersen said Monday in a statement released by the school. “The university, our staff and the involved student-athletes worked together with the NCAA to resolve the situation, including reimbursement of the benefits received, and that money was donated to a local charity,” Petersen said. After being notified by the NCAA of the potential violations, Boise State officials launched their own inquiry in 2009 and ultimately self-reported some previously unknown infractions. But before a resolution could be reached with the NCAA, Boise State officials discovered more serious problems in the women’s tennis program last fall. If your chapter slips up, how will your leadership react? Exercise self-governance and acknowledge the mistake, take appropriate action and move on? Or deny all wrongdoing, orchestrate a cover-up and let the problem worsen? There are too many stories of now dormant chapters that chose the latter.